The Battle Of Los Angeles also known as the Great Los Angeles Air Raid took place in the wee hours of Feb. 25, 1942, just over three months after the Japanese bombed Pearl Harbor and brought the United States into World War II. Air raid sirens began going off as anti-aircraft guns and searchlights began combing the skies over L.A. as they hunted for rumored enemy aircraft, but none were spotted or shot down. The incident was covered extensively by local and national press, but no one could give a satisfactory explanation of what precipitated the alarm. While the military eventually attributed the incident to "war nerves" and the sighting of an errant weather balloon, ufologists have speculated for years that our guns were actually firing at extraterrestrial spaceships. Although many eyewitnesses reported seeing a single, large unidentified object over L.A., a number of others also reported spotting anywhere from 25 to 200 planes "swarming" over the metropolitan area. But not a single bomb was dropped, and not a single enemy fighter was brought down. The round object itself was never recovered or seen again. 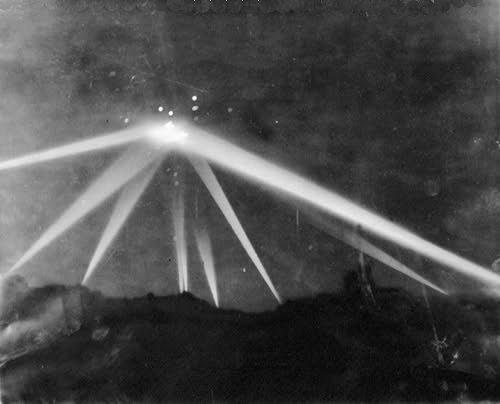 Despite the official explanation, no real answer to what or who started the Battle of Los Angeles has ever been found.